Well here we are at DFW 23Aug2013. Stephanie and Laurie drove us here - along with their kids (our grandkids), dumped us out on the curb, threw our bags out of the van and bid us good riddance! :-) Well - actually the bags were a bit heavy - and many - and it took some time to figure out how Brigitte and I could get two each and waddle into the ticketing area. We bid farewell to our very loving family, got our two biguns apiece, then stacked our carry-ons on to that, and it was a circus, I suppose, watching us getting into the terminal to get the bags checked. So off we went to Salt Lake City, got a rental car and then drove to Provo to stay with my (kent;s) sister Sherry. It was a very special weekend and we enjoyed it very, very much. On Monday, 26th we took what we needed for the MTC and headed thataway. Gigi (Sister Porter) chatted with the "welcoming committee" before we go inside to 'in-process'. 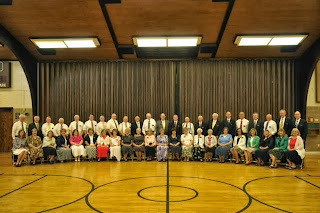 The Senior Missionary Couples met at the church just next to the MTC for our classes. We were oriented (well they tried, and as long as I took my medicine I was OK)... We had classes, did role playing, and met a lot of very nice people. During meals at the "CAF"eteria, we tried to sit with different folks each time to get to know them better. Some were from Nauvoo going to Hawaii, some were from elsewhere going to Nauvoo, some for office support in Ft Worth, and another couple who was supposed to go to the Alpine Mission in Austria/Germany, but wound up at the Visitor's Center in Palmyra instead. He had been in the Swiss-Austrian Mission just before it was divided and I arrived in Austria. He had worked a number of places in Austria I also worked and we knew some of the same people - small world! This is us toughing it out staying at the Provo Marriott. Although the "CAF" was a challenge, the Marriott was a bit out of budget for us, as we didn't know just what we would be faced with in Germany. We also had the opportunity to go into Provo and eat dinner if we chose, as we had a car and the MTC Rules were not strict for senior couples. We loved our trainers and had a great time. This is our District with our trainers. The couple to our right went to AZ in the mountains. The couple to our left is from MN and went to Elko, NV. That should be a change for them. This is our Senior Couples (24 couples). maintenance at the Polynesian Center in HI, and those who went into Office Staff went on to more training. Those of us who were MLS missionaries (Member-Leadership Support) were released Friday afternoon to check out of the MTC, turn in cards, settle accounts, etc. Some stayed there until departure to their field of assignment. We went to visit Sherry for the weekend and Monday as we didn't depart until Tuesday, Sep 3rd. This is NOT Sherry's place being renovated after our stay! This is us visiting the Provo Tabernacle which is being renovated into the new Provo Temple. The tabernacle burned a year or so ago and is being dug out, and will look great when it is done. That should be no surprise. The architects rendition of what it will look like when finished. We thought Sher's would be a great place to show off our new purse/bag and tie representing BERLIN!!!! We chatted with Gitti's brother Werner, then drove back to Provo to stay with Sherry. In front of Sherry's Ward in Provo, Sunday September 1, 2013. Cool and a little rainy, but beautiful in the Rockies. We drove to SLC International Airport early the morning of the 3rd. We had to be there by 6AM!!! We made it with time to spare and we met the Russells who were also going to the German Berlin Mission to serve as MLSMs. No pictures - it was too early and we were not sure we could focus well enough to use the camera. We flew to Atlanta - got there about 3PM, left on a Delta flight to Duesseldorf, leaving about 7PM to arrive in Germany around 10AM on the 4th of Sep.
yea! An update! So good to hear from you!